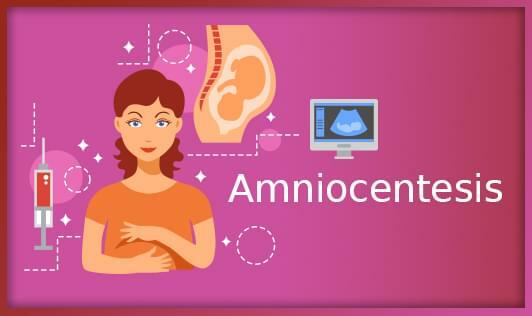 Amniocentesis is an invasive procedure which helps in the detection of prenatal diagnosis of genetic or chromosomal abnormalities and certain fetal infection. It is performed only when necessary information cannot be obtained by other non-invasive procedures like ultrasound scanning. It helps to determine whether to continue with the pregnancy or not and also helps to determine whether there is a need to deliver early to prevent complications. It should be done between 15th- 20th week of pregnancy. In which condition should it be performed? When there is a history of the previous child with chromosomal abnormalities. When the age of pregnant women is more than 35 year. When the ultrasound scanning detects unexpected abnormalities in the fetus. When there is concern that the baby may have been exposed to some types of infections. To detect an inborn error of metabolism. To detect x- linked genetic recessive disorders.